The stabby thing marks the spot. Another challenge in Fortnite this week is utilizing the Treasure Map loading screen in a fun new way to keep up with this season's pirate theme. X usually marks the spot, but in this scenario, it's a knife! 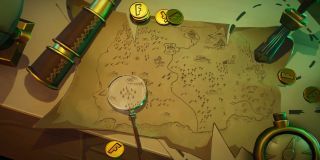 It's pretty easy to figure out the general location, but lucky for you we know the exact knife-point treasure location for easy battle stars. You can see in the image above that the knife is stuck right into the map on the eastern side of the island, south of Lonely Lodge. The Battle Stars can be found in a dark patch of grass just next to a cabin with some wooden fences around it. The map below shows exactly where you need to go. Happy hunting!